I am not the most adventurous person in life. I have always been fascinated with people who do extreme sports or indulge in adrenaline-pumping activities because I couldn’t ever be one of them. Mostly, because I have an overactive imagination (watching multiple Final Destination movies does that to you) and I really like staying alive. 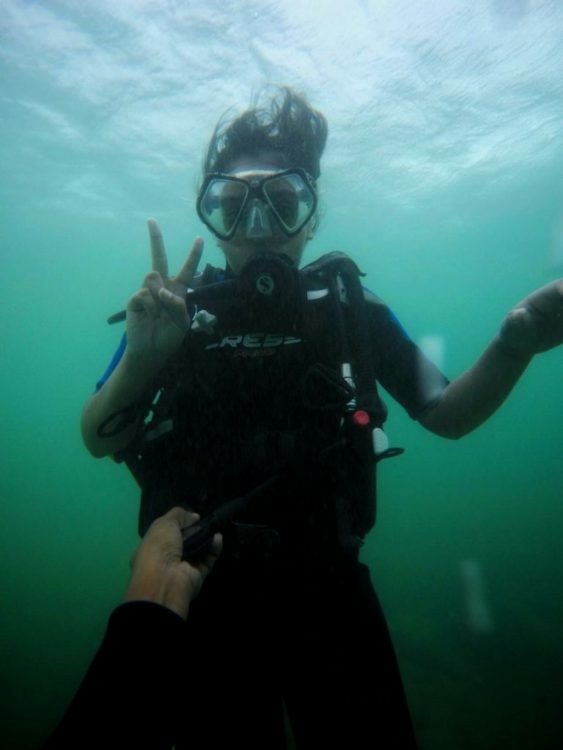 But, I really wished to try Scuba Diving once which is why I decided to give it a chance in Sri Lanka. However, I have always wanted to try Scuba Diving, Skydiving, Paragliding, etc. at least once in my life. I might not make a hobby of it but I wanted to understand the thrill behind it. My best friend has always been the more adventurous one among the two of us whereas I have always been the planner and the careful one. Hence, it was a surprise when I decided that I would like to try Scuba a Diving on my trip to Sri Lanka. In this post, I will describe it as best I can and will also elaborate on all the things I did so that anyone who is as afraid as me can enjoy this experience like me. Hope you all try it once too! When I started planning Sri Lanka, I was still toying with the idea of it and wasn’t sure if I would go through it. Actually, touching the fishes scares me. I feel that fishes will electrocute me or that a shark will eat me up. However, once I reached the area, I figured I would give it a chance. As luck would have it, Scuba Diving in Sri Lanka actually turned out to be a lot of fun and I got inspired to take the PADI Open Water certification. I googled about the cheapest places (Yet safe) where I could go for Scuba Diving. As I wasn’t sure if I would go through with it or not, I didn’t want to spend too much and then back out at the last moment. I checked Indian places and Sri Lankan places and looked at both the pros and cons of doing Scuba Diving at each of these places. While India would have felt safer, there aren’t many amazing sites for scuba diving and many places charged a lot too. I consulted with my friends and all of them told me to grab the moment and just do it in Sri Lanka itself. In Sri Lanka, Trincomalee, Hikkaduwa, Unawatuna, etc. were a few places which offered the best diving spots. Trincomalee was considered the best but since I was on the opposite end I figured my choice was narrowed down to Hikkaduwa and Unawatuna. 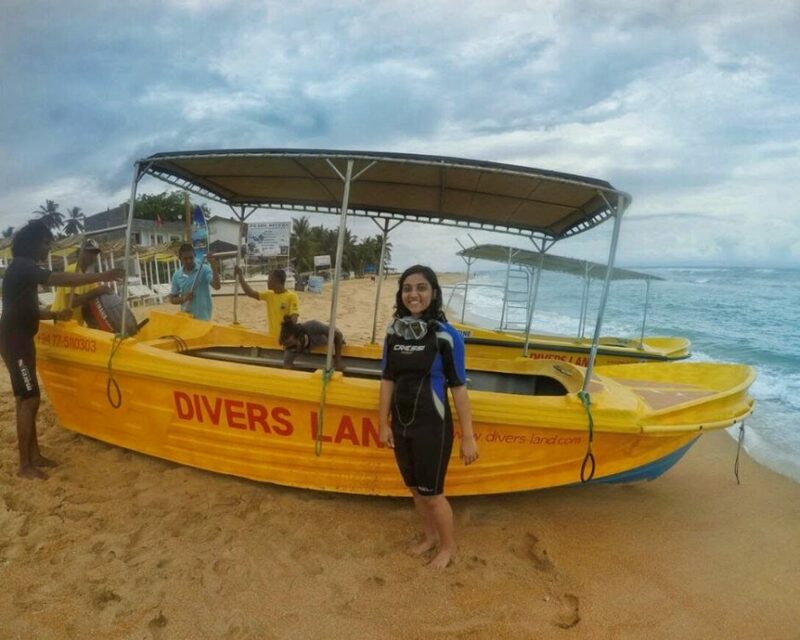 So, I asked a few people and got to know that Unawatuna would be the best place to have my first scuba diving experience. Once the place was decided, I had to choose a good scuba diving center for myself. So I asked a friend of mine about the cost and the equipment and the process. I was told that it is always wise to go through a Scuba Diving company which is PADI certified. First, make sure that your diving center has a PADI certification. If it is not PADI certified, then move on to a scuba diving center which is PADI certified. Professional Association of Diving Instructors (PADI) is a diver training organization who have divided the diving training into several smaller modules to ensure complete and proper learning. Any Diving Training center which doesn’t follow the guidelines is unfit to train, so avoid them. A lot of us have a weak eyesight which is why normal underwater goggles won’t work for us. This is why it is important that you select a scuba diving center which owns all the essential scuba gears including goggles with your eyesight power. Luckily, my scuba diving center had a huge variety of scuba gears, so I was able to see everything clearly underwater. If you wish to invest in a full face diving mask, click here. Check that all the equipment that your scuba diving center provides are in good condition and not torn from some corner. Always ask for clean equipment as you will be putting the mouthpiece in your mouth and you don’t want a dirty one. Next, check out the different sites which the diving school covers. There are many scuba diving sites available so make sure that the center takes to you a good site which is clear and you have something to look at. Lastly, you will need to check the cost of scuba diving and select one which matches your budget. There will be a lot of scuba diving centers which will cost you 5000-8000 INR. So, it is up to you which one you wish to have. In reality, the cost has nothing to do with the efficiency and services provided by a scuba diving center so choose wisely. On the day of your Scuba dive, most of you will feel a nauseous feeling. You will also feel butterflies in your stomach but it’s all fine. It’s a part of the journey. Now, a lot of people say that you should not eat immediately before swimming. So, make sure that you have breakfast at least 3-4 hours before your dive. Personally, I just had an apple since I was really nervous and that was enough before the dive for me. However, if you are a breakfast person (unlike me), then make sure you have a good meal. Scuba diving requires a lot of strength and energy so better fuel up before the real thing. Once, you reach the scuba diving center, they will tell you basic things about your equipment which includes your oxygen cylinder, swimming fins, goggles, and swimsuit. You will be told a few hand gestures that you will need to use underwater. Don’t worry, they are simple ones especially if you are diving for the first time. 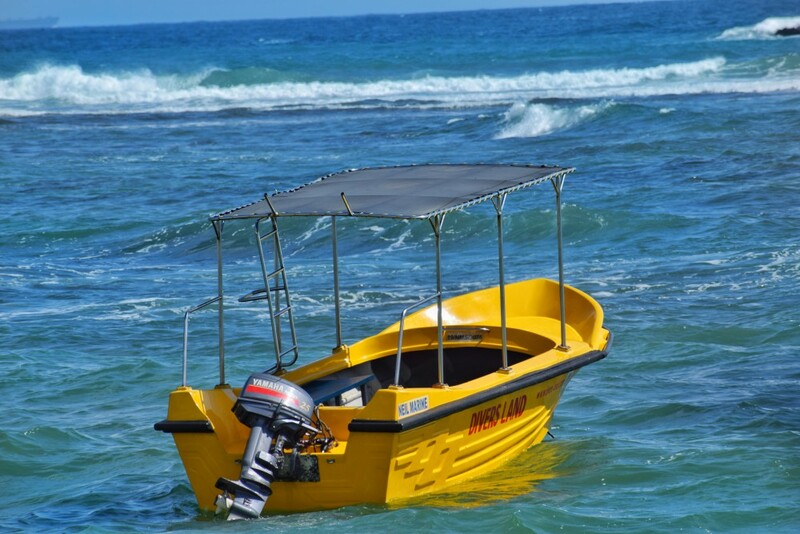 After that, they would take you to a pool area or shallow sea area for demonstration and preparation. The time for preparation usually depends on how quickly you learn. For me, it took around 30-45 minutes and my instructor was quite patient with me. So, make sure you choose a good instructor else you would be left stumbling yourself. In the preparation time, your scuba diving instructor will teach you how to breathe through your mouth and how to blow out air if it enters your oxygen mask. Then, the instructor will teach you how to clean your goggles under water and other important things. Make sure you pay attention during this time because it will help you a lot later on. One of the most important things to remember is that as you go underwater, the pressure increases. So, you might suffer from an earache periodically. This is nothing to worry about, you can easily pop out the pressure. But if you still feel terrible pain, let your instructor know asap. You have to be really careful with this else you might hurt your eardrums. Once you have mastered all the techniques, your instructor will take you to the main diving site so that you can have a real run at scuba diving. As I have already told you, I was really scared of the entire experience. What was even more terrifying is that they expected me to do a backflip on the main site. Yes, you heard me right! You have to do a backflip to get inside the water. This is because you might wobble the boat if you try to jump directly. I was scared and I almost backed out at this point but my instructor was quite patient with me. He motivated me and helped me get over my fear. I did a back flip and surfaced at the sea top in just a few seconds. It was an exhilarating feeling but it’s wasn’t over yet. In fact, I loved it so much that I am now planning to do a complete Scuba course. This will allow me to dive at other places as well, at a lower price. Trust me, scuba diving is one of the most freeing experiences in your life. And the underwater world is completely magical and enchanting. Make sure that you don’t miss out on it and give it a chance at least once! Happy Scuba Diving, you all!! Nice post, I just want to thank you for sharing your diving experience with us. I am a professional diver and according to me, one thing everyone can learn from Scuba Diving is to stay calm even in the most difficult situation.